Coral offers a £20 Free Bet Bonus, a slightly higher than they normally practice to attract new customers, with each £5 placed bet. It`s a pretty good idea, considering you only have to spend £5 and your £20 bonus is secured. To claim this bonus you have to create a new account on their official website. How do you do it?! We’ll show you here. You`re now being directed to the registration page, where you have to fill in your Personal details, create a username and a password, choose your currency and check for Age Verification, Terms and Conditions, at the bottom of the page. Once you`re done with filling that up, click the ”REGISTER” tab. Congrats! Done! 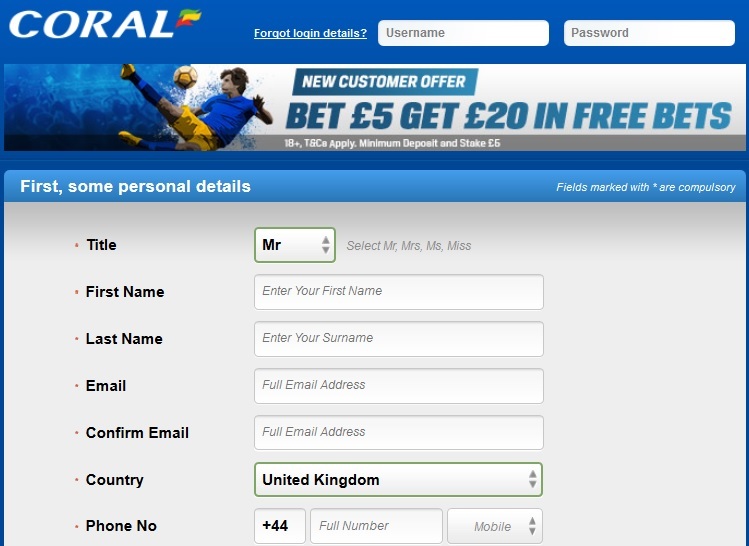 For more information, we strongly advise you to visit their official website https://www.coral.co.uk/ , and read all the data you need, before placing a bet or doing anything else on their website.